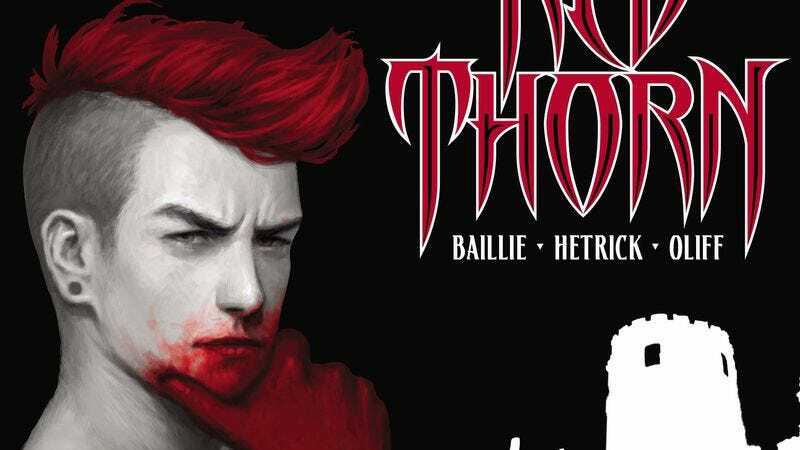 Vertigo titles have been exploring mythology since the start of the imprint, and this week’s Red Thorn #1 continues the tradition by delving into the legends of Scotland. Writer David Baillie, artist Meghan Hetrick, and colorist Steve Oliff’s new series takes readers to Glasgow, where Isla Mackintosh is investigating the mysterious disappearance of the sister she never knew. It doesn’t sound especially fantastic until you figure in the fact that Isla’s drawings can come to life, a piece of information that eventually leads to an ancient Scottish demigod and the rise of deadly army. Most of the new Vertigo titles have been plagued by heavy exposition, and this preview of Red Thorn #1 is no exception. But Baillie has the benefit of an artistic collaborator that can present the information in a visually engaging manner. Hetrick’s expressive characterizations and detailed environments draw the reader into Isla’s experience, and her two-page spread revealing Isla’s notebook reveals a skill for unconventional layouts that make Baillie’s script more dynamic. Steve Oliff’s smooth, evocative coloring brings depth to the artwork and marks big shifts in the narrative, like his switch from cool blue to bright gold when the story jumps from Isla’s present-day adventure in Scotland to her first discovery of her supernatural drawing ability. There’s a lot of potential in this creative team, and hopefully Red Thorn won’t get bogged down by the overly wordy scripting that has been a consistent issue with Vertigo’s fall debuts.